Worried about market risk? Our free online questionnaire will only take a few minutes to complete and can help us discover your personal tolerance for risk. We can help guide you through shark-infested waters. Our goal is to manage your family's wealth to minimize your stress and maximize your financial independence and personal well-being. We help business owners, key employees, retirees, and surviving spouses who prefer to delegate their wealth management to a professional. Our clients are financially successful, but would rather spend their time on more enjoyable things than watching the market. Our clients would rather focus their energy on their passions, their families or their favorite causes. They prefer to spend their time on the things they enjoy rather than be concerned with the burden of analysis or economic data. If you look forward to having more fun in retirement, and want a long-term relationship with your advisor that goes beyond numbers - we should talk. Are you looking for a fun, interactive and fast-paced presentation for your group? 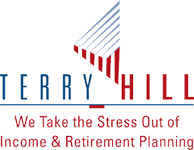 If so, CLICK HERE to learn how you can schedule Terry Hill to speak for your upcoming event! To See What Makes Us Different!